With his solo programme Vitold Rek carries us off into the world of age-old but newly-interpreted Polish hymns and folk songs. "A CD of original music and original arrangements for solo double bass and voice. The works include Polish folk music, short jazz essays, and character pieces. They are charming, witty, moody, and have an organic, home grown quality. Rek pays homage to the Jewish history of Middle Europe, as well as Polish history. The church setting, and its many seconds of decay, in which this project was recorded truly brings out the atmosphere of the hymn." "In Boychik Vitold Rek conjures up Jewish components of Polish tradition with impressive effect." 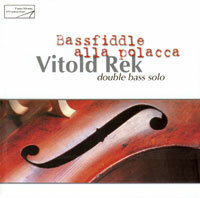 "To truly experience Taso in the purest sense, Rek's Bassfiddle alla Polacca is required listening. A reflection of polyglot southeast Poland and its music, it brings together Polish, Romany and Yiddish influences into a single instrumental triumph. Through varied tempo and touch while alternating plucking and bowing Rek is able to be true to both the ethnic base of his writing and at the same time produce modern jazz."